Plenary Lectures. Topic 1 - Off-Line Systems. Topic 2 - On-Line Systems. Topic 3 - Computational & Numerical Solutions Strategies. Topic 4 - Integrated And Multiscale Modelling And Simulation. Topic 5 - Cape For The Users!. Topic 6 - Cape And Society. Topic 7 - Cape In Education. 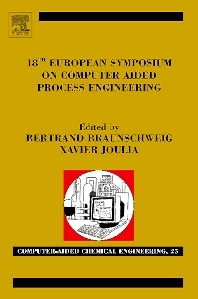 The 18th European Symposium on Computer Aided Process Engineering contains papers presented at the 18th European Symposium of Computer Aided Process Engineering (ESCAPE 18) held in Lyon, France, from 1-4 June 2008.
discuss innovative concepts, new challenges, needs and trends in the area of CAPE. This research area bridges fundamental sciences (physics, chemistry, thermodynamics, applied mathematics and computer sciences) with the various aspects of process and product engineering. The special theme for ESCAPE-18 is CAPE for the Users! CAPE systems are to be put in the hands of end users who need functionality and assistance beyond the scientific and technological capacities which are at the core of the systems. integrated and multi-scale modelling and simulation, Two general topics address the impact of CAPE tools and methods on Society and Education.